Birmingham now biggest base for budget carrier with 12 aircraft at transport hub. Flybe marks the launch of new routes from Birmingham with (from left) UKTI export ambassador Peter Mathews, Flybe regional sales manager Paul Willoughby, Birmingham Airport trade relationship manager Mandy Haque and Beatrix Troger from the German British Chamber of Commerce. Budget airliner Flybe has announced three new &apos;twilight&apos; routes from Birmingham Airport as the company marked the launch of its new Cologne service. The firm, whose largest base is at Birmingham with 12 aircraft, will be running late evening flights to Ibiza, Palma and Reykjavik three times a week in the height of summer. It said the Birmingham to Reykjavik flights would be providing the first ever scheduled services between the two cities. 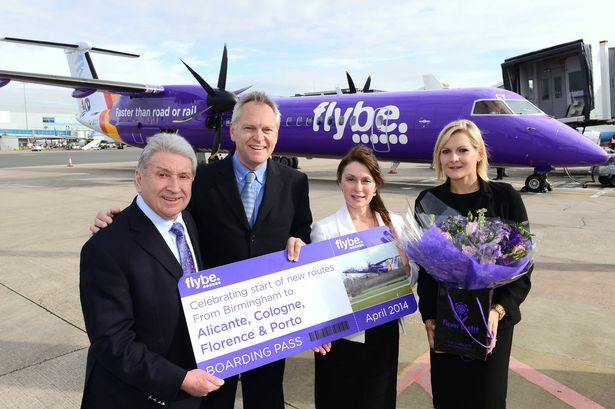 Flybe also celebrated the start of its new services to Cologne, Florence, Porto and Alicante with inaugural flights to the European cities. Flybe&apos;s chief commercial officer Paul Simmons said: "The start of our new routes mark the tangible reality of our major expansion at Birmingham and we are delighted that such an influential business contingent was able to join us on our &apos;purple flight&apos; to Cologne. "Flybe is committed to helping develop and expand the regional economies within which it operates and we certainly hope some good relationships were nurtured as a result of today&apos;s high profile visit." Four other new Flybe routes out of Birmingham will take off in May to Bordeaux, Palma, Toulouse and Newquay.